Widely regarded as the most famous hiking trail on the planet, walking the Inca Trail to Machu Picchu ranks high on Bucket Lists across the world. Part of the extensive network of trails built by the Incas to connect their vast empire, the trail winds through some of the most spectacular mountain scenery in South America, it passes the breathtaking ruins of the most important archaeological sites of the Incas and it culminates at the Sun Gate to Machu Picchu, one of the new 7 Wonders of the World. Joining a trek on this iconic trail is guaranteed to be a journey of a lifetime, creating memory after unforgettable memory. Whilst the classic Inca Trail is completed in a trek over 4 days, on this itinerary we allow ourselves an extra day. Not only so that the pace of the trek can be a little more relaxed but, more importantly, so that we can spend longer truly immersing ourselves in the spectacular mountain scenery and amongst the awe-inspiring ruins. This trek is a once in a lifetime opportunity that we don’t think should be rushed! You will be accompanied at all times by one of our expert guides. We pride ourselves on hiring the most professional, friendly and knowledgeable guides in the area and they will really bring the trek to life for you, whilst ensuring your safety at all times. Camping deep in the Andes is an experience like no other, and our Porters and Kitchen Team will ensure your absolute comfort while never taking away from the rugged nature of a trek in the mountains. 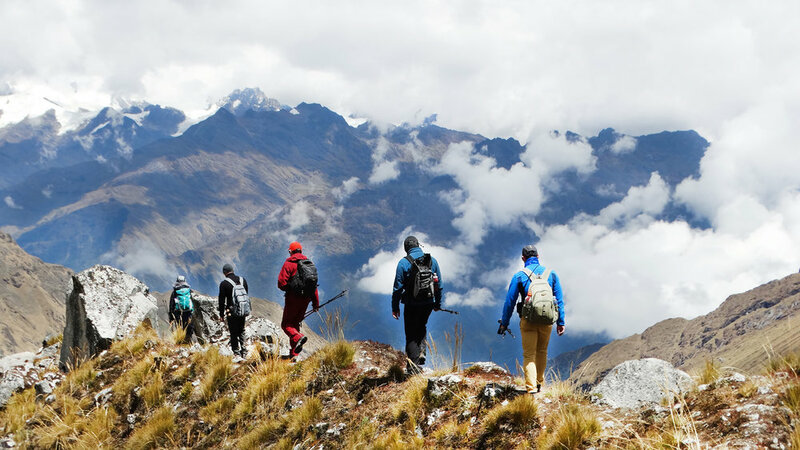 To protect this historic trail, the maximum number of people allowed to hike the Inca Trail each day is 500 (including hikers on the 2, 4 and 5 days hikes and all the workers such as porters, cooks and tour guides). Sometimes the spots are filled at least 6 months in advance or more. For this reason we highly recommend you book your spot as soon as possible. Note: To book the Inca Trail, we need your personal information in order to send it to the Inca Trail regulator office. This office needs all reservations at least 4 days before your departure hike. Please note that May through September are the months with the highest demand and spaces sell out very quickly. We will pick you up very early from your hotel and transport you to start of the trail (km 82). From here you will begin the journey, warming up on the relatively flat part of the trail. After 2 hours, you will reach the first archaeological center of Patallacta where you will appreciate the impressive landscapes, flora and fauna. This site and others will show the importance of this valley in the context of Incan history. After lunch, we will continue ascending to a semi-tropical valley for 2 hours until arriving at our camp, Hatunchaca, where we will spend the night. After breakfast, we will start hiking early in the morning of the second day, passing through different climatic and ecological zones. We will ascend to Warmiwañusca where we will walk amongst abundant vegetation with various types of trees. This pass is known by many as the world’s highest cloud forest. After the toughest part of the journey, an ascent of nearly 5 hours, we will arrive at the highest point, known to some as Dead Woman’s Pass. From there, we will take a well deserved break and observe the beauty of the deep valleys. If we’re lucky, we will see the flight of the condors and will pass among the thick clouds in the sky. After this rest, we will descend towards our second camp at Pacaymayu. We will climb steeply up the opposite side of the valley wall, towards the second pass. About halfway up lies a small, round, roofless stone building. This Incan ruin is known as Runkuracay, a building thought to have been an astrological site and a sort of checkpoint for couriers following the trail to Machu Picchu. After a short tour, we will continue to ascend towards the second pass, the Abra de Runkuracay. On the far side of the pass, the trail descends towards a valley and a shallow lake. 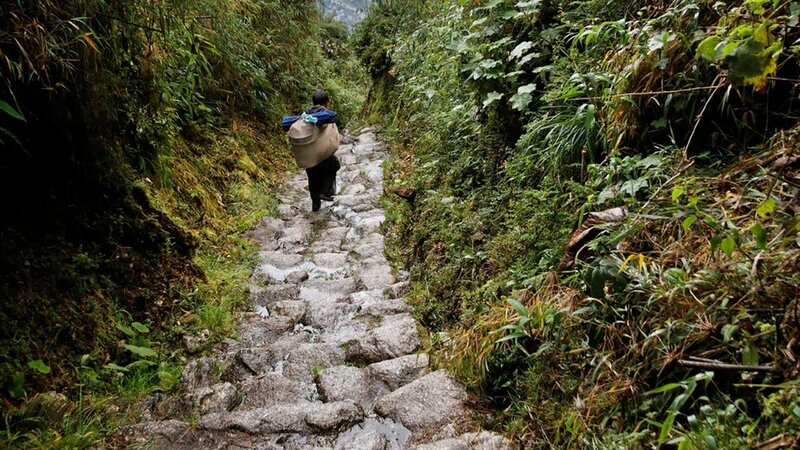 At this point, the trail changes from a dirt path to a narrow stone roadway, containing the exact stones that were in place when the Incas walked the trail. The trail after the pass leads to a second, larger Inca site, Sayacmarca (“Town in a Steep Place”). This Inca ruin was built on a rock overlooking the trail and is accessible only via a single narrow stone staircase. On the left of the staircase lies an overhanging rock wall and on the right a sheer drop with expansive vistas of the Peruvian countryside. This site is roofless and slightly overgrown, but the walls still stand strong and the shape of the fortress can easily be seen. We will also see a stone aqueduct, which carried water to the farmlands. After touring Sayacmarca, we will descend to the valley floor. The roadway takes the form of a long causeway leading across what may once have been a shallow lake. We will stop at this valley to enjoy lunch. After lunch, you will begin to climb again. At this point, you will pass through interesting Incan structures, including a tunnel that is 8 meters long and wide enough to allow humans and animals to pass through. After this tunnel, we will reach the third pass and enjoy the third Incan site, Phuyupatamarca (“Cloud-level Town”). We will learn about the ritual functions that the Incas used this site for. Here we will see baths that Incas bathed in before they reached Machu Picchu. The highest baths were reserved for the nobles, while the lower down baths on the side of the structure were used by the lower class. Third campsite at Phuyupatamarka. After breakfast we will descend for around 2 ½ hours and arrive to the Incan site known as Intipata, a huge farming terrace, and you have a gorgeous view of the valley, then descend to the fascinating Wiñaywaina at 8,700 feet (2,650 meters). We will stop at this site, which means “eternally young,” and have lunch before continuing to the Sungate. After an hour of walking, we will arrive to the Sungate where we will have our first view of Machu Picchu. After a rest, we will descend towards Machu Picchu where we will take pictures and rest before taking the bus to the nearest campsite Puente Ruinas, close to Aguas Calientes town. We will wake up very early to take the first bus to the city of Machu Picchu, where we will be the first visitors of the day to enjoy the magic and mystery of one of the wonders of the world. The tour with your guide will take around 2-3 hours. After that you will have free time to explore the entire city on your own. In the afternoon, we will take the bus down to Aguas Calientes to board the train to Cusco. Airport pick-up & drop-off. We will pick you up at the airport and transport you to your Cusco hotel when you arrive in Cusco. At the end of your Cusco visit we will transport you back to the airport.